Gifts from the Pirates: Gifts from the Pirates is brought to you by the colour 'Purple'. Gifts from the Pirates is brought to you by the colour 'Purple'. We had a great start to the weekend just gone. Seth had a Tae kwon do grading a few weeks back but needed do sharpen up on some of his moves so has been practising at home. Last week he passed the physical side which he was really excited about so since then we have been practising his questions so that he can move up to his purple belt. Seth has such a great memory and picks up things really quick. 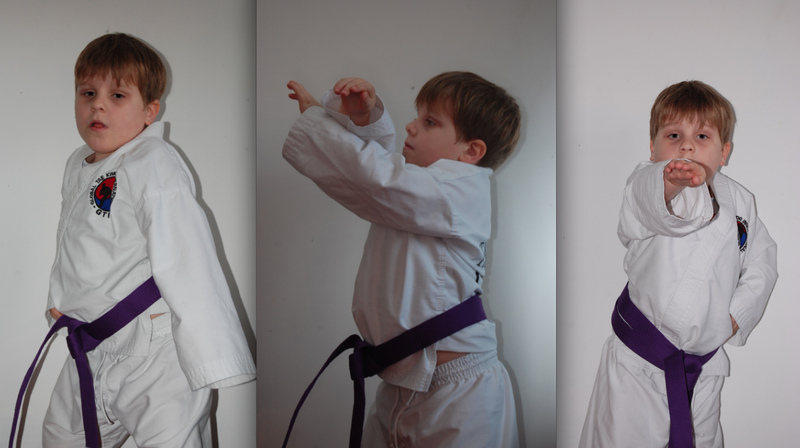 Seth passed his questions Saturday morning and is now donning the purple belt with pride. He had a lovely smile on his face when he strutted in the house to show mommy. We're all very proud of him and I can be safe in the knowledge that if there's ever a situation when I need to say 'low block' to someone in Korean (its bound to happen at some point haha), I can confidently say "Najunde Makgi".